1. 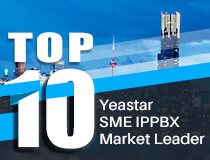 Connect the phone to the same network with Yeastar S-Series VoIP PBX. The phone will send a PnP request to the PBX when booting up. 2. Log in Yeastar S-Series VoIP PBX Web interface, go to “Auto Provisioning” App. Click “Scan”, all the phones in the local network will show up on the page. 3. Search the phone by IP address or MAC address, and click “Edit”. 4. Choose the phone Model, active a line and assign an extension for the phone. You can also configure keys, features, preferences and codec for the phone. 6. The system prompts you to reboot the phone, click “OK”. The phone will reboot and configure automatically. Note: if the phone doesn’t reboot automatically, please reboot the phone manually. 1. Connect the phone to the same network with Yeastar S-Series VoIP PBX. 2. Disable local DHCP server in your local network, e.g. disable DHCP server on Linksys router. 4. Go to “Auto Provisioning” App. Click “Scan”, all the phones in the local network will show up on the page. 5. Search the phone by MAC address or IP address, and click “Edit”. 6. Choose the phone Model, active a line and assign an extension for the phone. You can also configure keys, features, preferences and codec for the phone. 8. The system prompts you to reboot the phone, click “OK”. The phone will reboot and configure automatically. What is with M700 ? ?